Abstract: We like it when a manufacturer goes out of their way to "wow" the customer with packaging. For overclockers, the search for high quality (good overclocking) memory never ends. There's a new player in town and GEIL (Golden Empire Int Ltd) is promising everything including the kitchen sink from their memory. Being the first manufacturer to claim their memory can run at PC3500 speeds (DDR433) is quite a feat, not even the big boys like Corsair, Mushkin or OCZ can do that yet! We like it when a manufacturer goes out of their way to "wow" the customer with packaging. 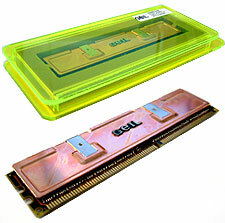 Like Mushkin's neat air packaging, the GEIL memory came incased in a very cool looking neon green plexyglass case that certainly grabs attention! Inside the well protected case sits the PC3500 DDR module in a vacuum sealed in a static bag. Below the memory is a quick FAQ on how the memory works, possible problems you might have and how to remedy them. After talking a bit to GEIL, I found out that they actually produce their own DRAM modules and DIMM PCB's. GEIL say "this is the only way to ensure the highest quality parts" go into their memory. Whether this is true or not we'll be finding out soon enough as we stress test the memory as far as it will go. As you can see from the pictures the memory has some pretty heavy duty RAMsinks on it like the ones found on Mushkin and OCZ memory. This is a pretty good idea since DDR RAM at high speeds does get quite hot when it's naked. Looking at GEIL's website we see that the PC3500 DDR is actually specially handpicked 6 ns modules that require anywhere from 2.7V-3.0V to run at rated speeds with timings of 2.5CAS 6-3-3-2. To be honest, here we're a little concerned about the memory voltage requirements and possible motherboard compatibility because of it. Not many motherboards out there, Intel or AMD, allow memory voltages above 2.8V. In fact the only ones that immediatly come to mind are Epox motherboards - so if you decide you want to tweak the voltage above 2.8V you'll need to look in that direction. We tested with an Abit Intel motherboard at 2.8v and that worked just fine. We usually test all DDR memory on AMD based systems, but the GEIL PC3500 didn't seem to like the Epox 8K3A+ test motherboard. Even with the motherboard at stock speed (133 MHz FSB, 166 MHz memory) the GEIL PC3500 wouldn't POST until 3.2V worth of voltage was applied to the memory! After playing with it for about an hour the highest stable speed I was able to attain with the most aggressive memory timings (2-5-2-2-1) was 176 MHz FSB. With the most conservative, 186 MHz. 30 MHz away from the 216 MHz GEIL claims the memory can run at. We tried running the memory in other AMD based DDR boards and found we still had some compatibility problems. "Why don't you use an Intel based systems to test memory?" I get asked that question a lot from readers here, and from the newsletter, and the reason behind that is that CPU speed affects memory bandwidth scores. Since all Intel multipliers are locked, when you raise the FSB to test memory you're also raising the CPU speed. Here's an example (using AMD systems though because I only have one P4 test processor), using the Epox 8KHA+ with an AthlonXP 2000+ we get memory bandwidth scores of 2014MB/s ALU / 1903MB/s FPU. Using an AthlonXP 2100+ (only 66 MHz faster then the XP2000+) the memory bandwidth is 2048 MB/s ALU / 1970 MB/s FPU. Am I just being trivial or picky here? Just imagine how different the bandwidth would be if the CPU's were running 200 MHz, 500 MHz or even 1 GHz faster? This doesn't just affect SiSoft Sandra memory bandwidth scores, but also skews other benchmarks as well because the CPU speed is now higher. That being said we did use a Pentium 4 system to test the memory and it ran flawlessly on the test Abit BG7 (i845G) with a P4 1.6A. Enabling the 4/5 memory divider (making the memory run faster then the FSB) we were able to push the FSB up to 167 MHz before our CPU maxed out. The final memory speed we were able to attain was 417 MHz, but we're sure we could have gone higher if the CPU not max out. Everything was with the most aggressive memory timings enabled in the BIOS as well! It was interesting to see that Sandra Identified the stick as GEIL's PC3200 model.